Whether we are just looking for a first date, catching up with friends or need some thing to keep us going through a morning or afternoon's activities, then you will be looking for a nice cafe. But more than the quality of the coffee and the richness of the cake, there is the right location. Personally, I love a cafe that is in a great outdoors location. All these cafes are selected because of their focus on outdoor seating and the location itself that gives them a great link to nature. Some provide views and others are surrounded by the natural environment. The art precinct in Brisbane's South Bank is has a range of different cafes, each with its own style. 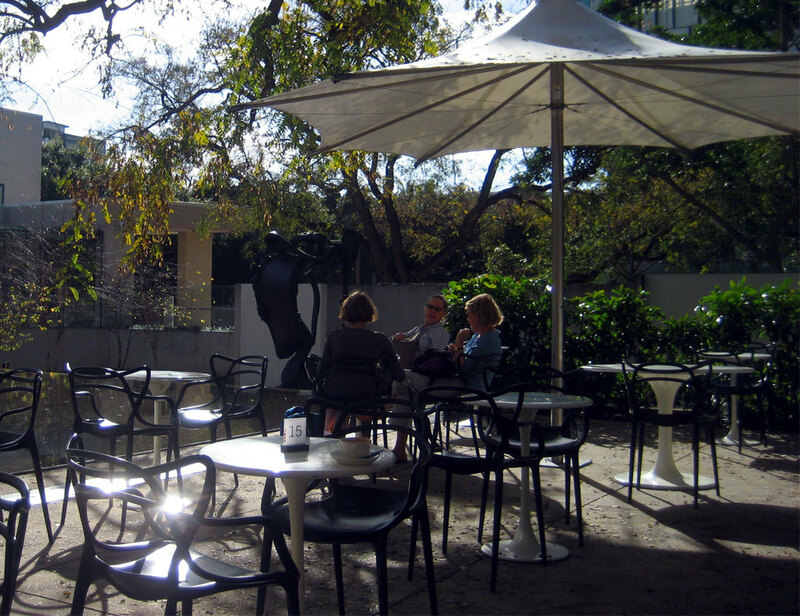 The cafe at the Queensland Museum is a great family orientated location to feed your kids between other activities, The Library Cafe and shop is more of a refueling location for students studying in the library with good coffee and decent, but not expensive meals. The GoMA Cafe and bistro provides a more upmarket and arty experience. 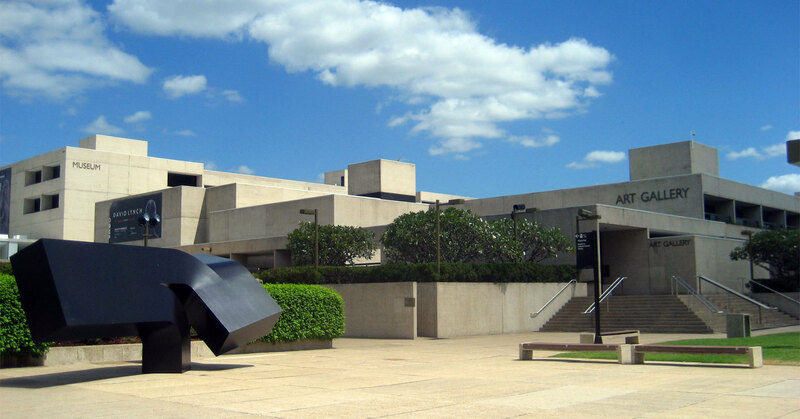 However my favourite cafe in this area is the Queensland Art Gallery Cafe or QAG Cafe for short. This competently run cafe does coffee, tea, beer, wine, sandwiches and a nice selection of meals. 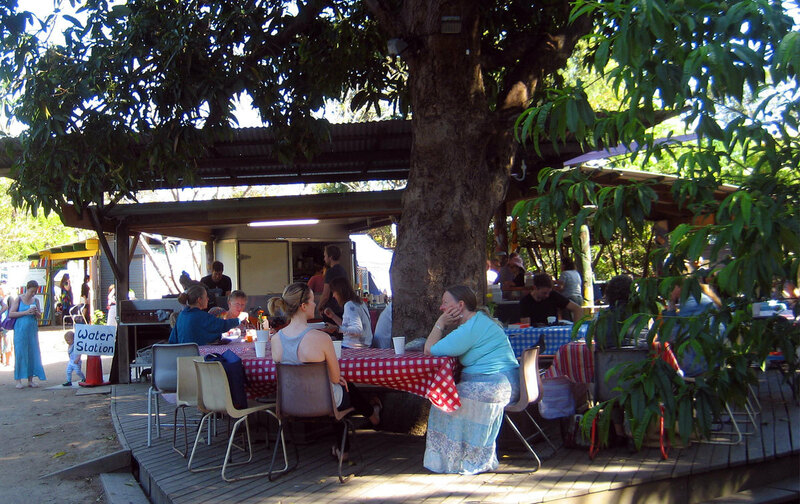 In other words, in terms of food and drink, it is a cafe just like many others around Brisbane. However when it comes to the location, it is unique. The wonderful setting in the shady Art Gallery's gardens makes it my favourite location to relax. The numerous art works in the garden are scattered around a wonderful water feature. You don't even need to buy a cup of coffee to visit this location, just wander in through the glass doors and enjoy the gardens. For me, this is the spot to enjoy a snack and a drink after appreciating art. 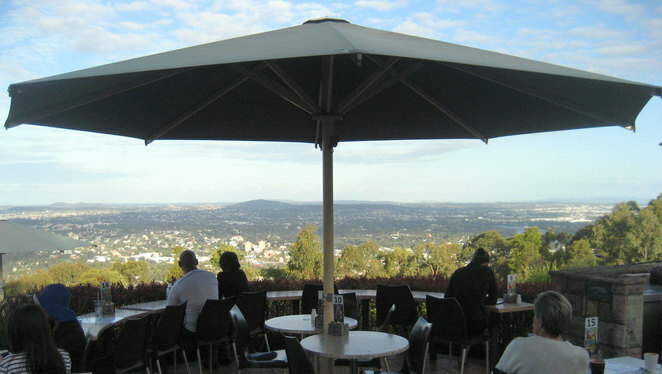 If there is a restaurant in Brisbane with the best view, it has to be the Cliffs Cafe. 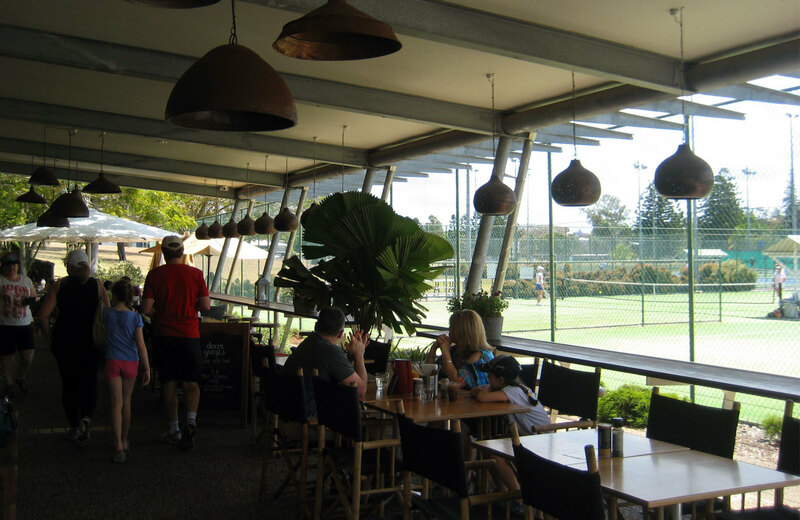 Perched on top of the Kangaroo Point Cliffs it is once again nothing more than a competently run cafe and opens from 7 am to 5 pm, 7 days a week. Oh, and of course it is in the perfect location. I really don't understand why no one has bulldozed this cafe and put in place a high end restaurant, trendy bar and cool cafe, but in many ways i am glad. Even without the view of the city from on top of the cliffs, it is a lovely outdoor location. 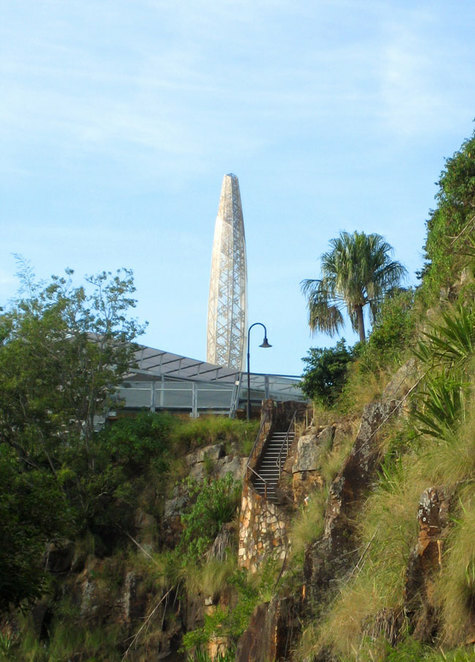 Kangaroo Point Cliffs Park is where boot campers and boxercise classes are conducted every morning in the shadows of some interesting art works. The most prominent artwork is Venus Rising: Out of the Water and into the Light. It is also an almost perfect location to end a walk, run,cycle or whatever activity takes your fancy along the Kangaroo Point Cliffs.Great in the morning for breakfast. Pity that it doesn't open at night. I have described all the cafes in this list so far as competently run. However I don't like to say that about Kuta Cafe, even though I would recommend the place, there are some short comings. We have waited an hour for a takeway cup of coffee and meals are slow to arrive and a not really large enough to be considered much more than a snack. Some of the food is not really that good either. Having said that, the coffee is actually pretty good and the ice cream is both delicious and cheap. The cakes are great and to be honest, I don't mind those being small. But the reason to go to the Kuta Cafe is the view. Unless it is actually raining, people always choose to sit outside to enjoy the vista. While it is easy to drive up to the cafe, you can also walk up to the cafe from several directions, including the Honeyeater Track that starts in Chapel Hill or walk the Summit Track and visit the Aboriginal Art Trail. I will continue to complain about this cafe, even though I end up visiting it several times every year. It is a perfect date cafe, especially at night overlooking the city lights. This cafe stays open until 11 am on Weekends. 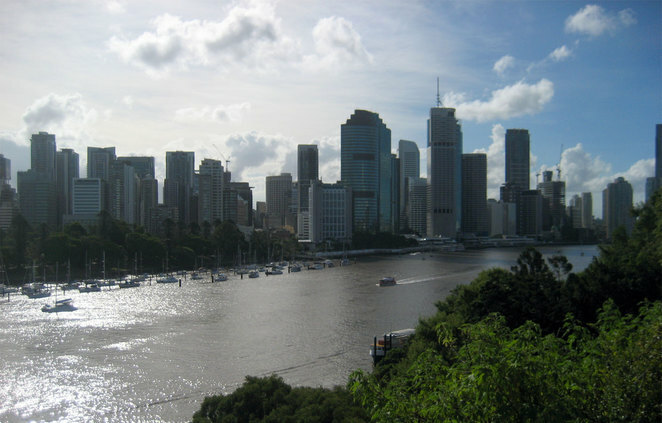 If you haven't visited a University Campus in Brisbane Lately, then you may not have realised that they have become the home to numerous cafes that are funded by student's needs to get through exams, finish essays and go on cheap dates. St Lucy's in St Lucia (it is not much of a pun, but I still like the name) is a great upscale university cafe. While all the dining is undercover none of it is enclosed, creating a wonderful indoor, outdoor feel. It opens at 7 am 7 days a week and closes at 9 pm on weekdays. While it makes the list for the location, this is a great cafe in its own right. Normally I go here after playing tennis, which means I grab a smoothie. But some of the people I play tennis with grab a late breakfast or early lunch. When it comes to dining, these are meals that have great attention to detail and innovative without being pretentious. With the location next to the tennis court, the temptation is to go for the sporting activities (such as tennis, swimming and so on) and then head to St Lucy's afterwards. 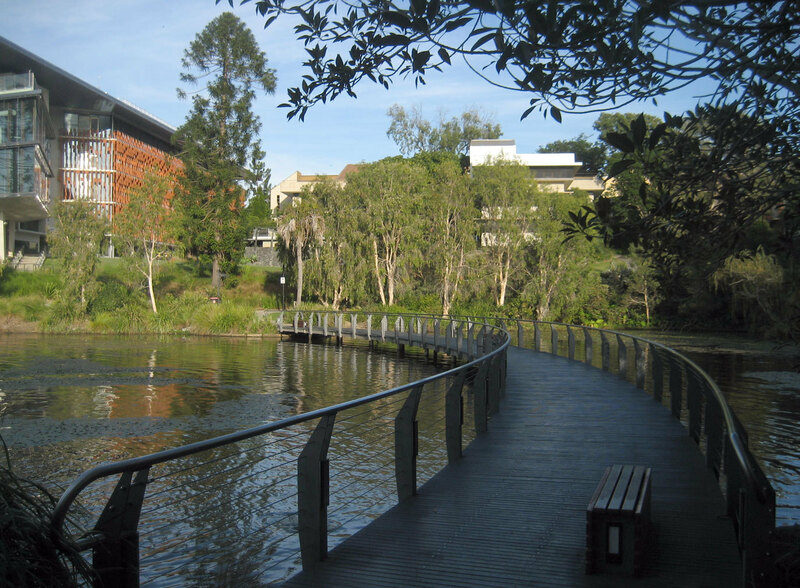 But there are many other reasons to visit the University of Queensland's St Lucia Campus. 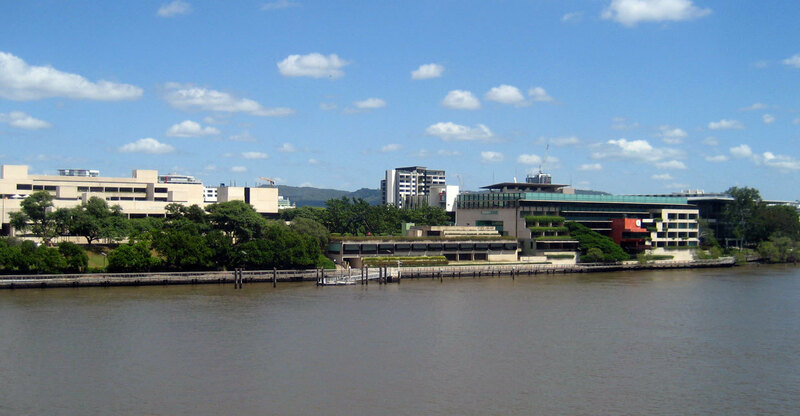 These include walking around the lakes, especially during Jacaranda season or visiting the great art gallery. Don't forget to pop into the wonderful art gallery that is also on campus. Or to be honest, if you live nearby, you can just head to St Lucy's. You don't really need a reason to be on campus other than that. 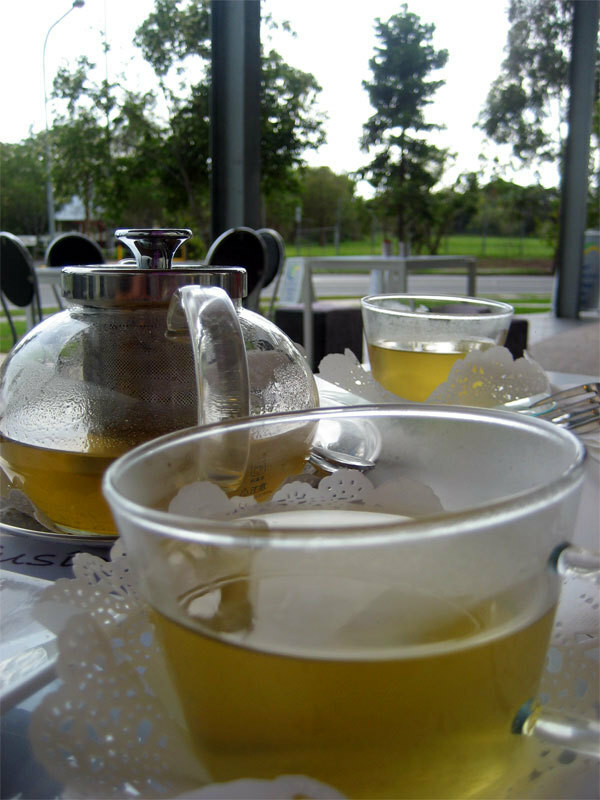 There are a number of cafes in Brisbane that overlook beautiful locations, but only The Green Tree Frog Cafe integrates into them so beautifully. Yes this cafe is all about location, location, location. 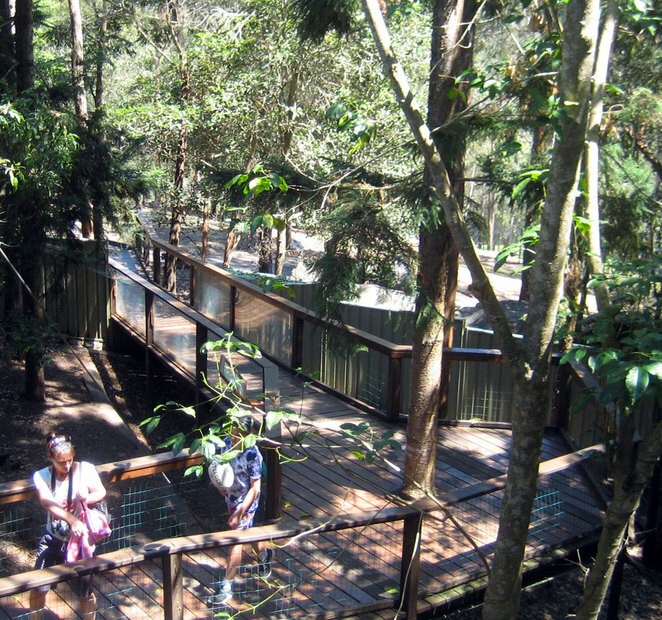 First of all it is at Walkabout creek on top of a little zoo that features local animals and is a great spot for the kids and visitors to Australia. The best place to sit is at one of the tables overlooking the pademelon enclosure though you can also choose to overlook the aviary as well. 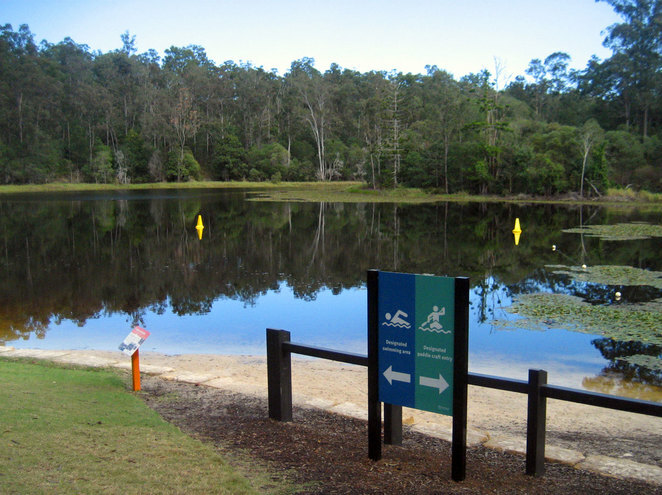 Then of course you are next to Lake Enoggera, which is now open to swimming and kayaking. 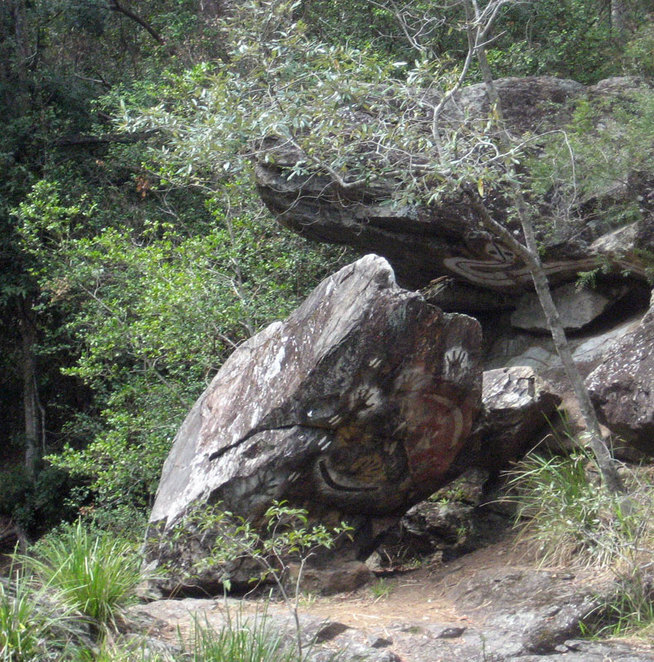 There are also a range of bush walking tracks, to explore. You can do a short walk beside the lake or choose to walk the 12 km or so around the lake and back to the cafe. The reason to come to this cafe is the location. Sure you could come here for coffee, cake and a basic meal, but I suspect few people do that. On weekdays the cafe opens from 10 am and closes at 2 pm and on weekends it is 9 am to 4 pm. The Chai Cafe only open once a week on Sundays from 6 am to 11 am, but it is on the list because it is by and far the best outdoor cafe experience in Brisbane. The building itself has a very organic feel and really you are not sitting in a building but under the branches of a tree. 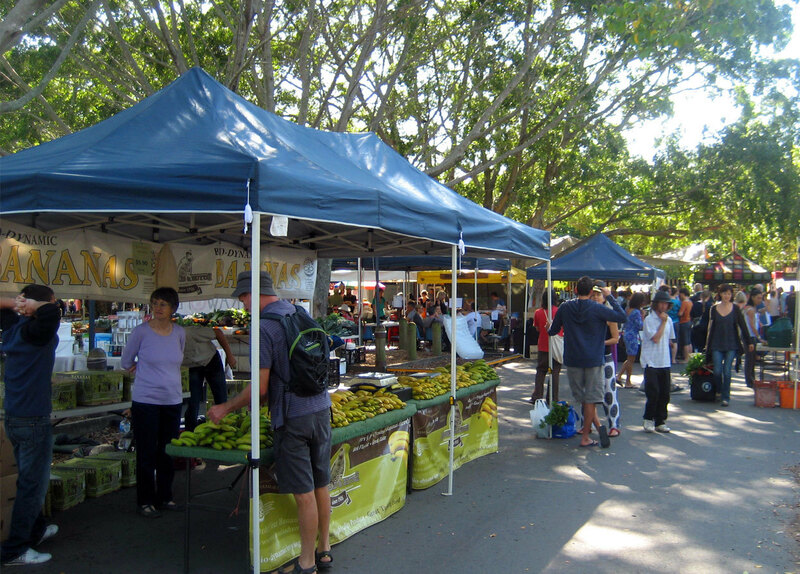 So get up early, do you grocery shopping for the week, then have breakfast under a tree. Definitely a good reason to get up early on Sundays. Look like they are great spots. I will have to visit, but as an "out of towner" I don't get a lot of opportunity. I do love the Cliffs Cafe with those awesome views of the city across the river.